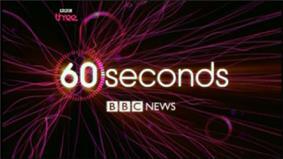 60seconds is a news programme which runs between shows on BBC Three. It broadcasts under the BBC News format and branding. The main presenter is Sam Naz. Previous presenters include Tasmin Lucia-Khan, Andy May, Matt Cooke, James Dagwell and Claudia-Liza Armah. The programme lasts for 60 seconds as the name suggests, during which time the presenter condenses some of the day's news, sport and entertainment stories into a 60-second bulletin. It only runs from 7pm–12:15am with a bulletin at the top of the hour or after a programme has ended, if more than an hour. Throughout the bulletin, a line gradually crosses the screen which effectively counts down the seconds. There are two sets of pictures running simultaneously for each story. Five stories are featured in every bulletin. 60 Seconds is presented in a style in keeping with the channel. Humour is a feature and some of the scripting often raises a smile. During the 2012 Summer Olympics and 2014 commonwealth games bulletins ran from 7am–12:15am with a round-up of the day's other news stories. 60seconds was launched on 16 July 2001 on BBC Choice, the precursor to BBC Three, to appeal to those within the 18–34 age group; BBC Three's target audience, and also the demographic with lowest news-watching and voter turnout. When BBC Choice was replaced by BBC Three on 9 February 2003, the programme was kept and the titles updated to match the style of The 7 O'Clock News also on the channel. There was a rebrand of BBC Three on 12 February 2008, during which the identity of 60seconds also changed to match the new colour scheme of the channel. The first broadcast of the revamped 60seconds saw a new take on the news; the headlines of news channels across the world, such as Al Jazeera and CNN, are read as opposed to the original UK headline bulletins. However, maintaining its original purpose, the UK's headlines are still included in the bulletin, as well as most of the original properties of 60seconds, with the keeping of the two images–videos running parallel to each other. On 18 March 2013, 60seconds, along with the rest of BBC News, moved to Broadcasting House. This can be used as a stepping stone as James Dagwell moved to BBC World News and the simulcast between BBC World News and BBC News Channel overnight as a presenter. Charlene White is now a regular on ITV News. Tina Daheley now co-presents Freespeech, Susannah Streeter is another BBC World News presenter. In October 2013 it was announced by Director-General Tony Hall that the program would be rebranded to bring it under the Newsbeat banner of the BBC's youth radio station, Radio 1. In March 2014, it was announced that 60seconds will be axed as well as its main channel, BBC Three in late 2015. All current programs on BBC Three will be moved onto the BBC iPlayer website, but it has not yet been revealed if 60seconds will be moved online too.However the final decision will be announced in autumn 2015.